This text covers both the theory and procedures related to the diagnosis and service of automotive suspension and steering systems, using a unique two-volume approach to optimize learning in both the classroom and the auto shop. 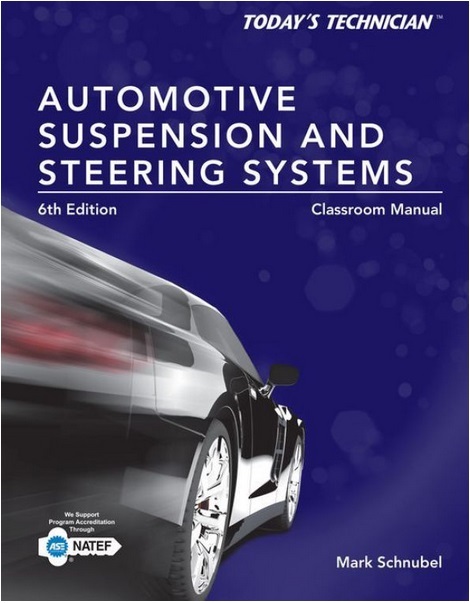 The first volume (Classroom Manual) details the theory and application of suspension and steering systems, while the second (Shop Manual) covers real-world symptoms, diagnostics, and repair information. Known for its comprehensive coverage, accurate and up-to-date details, and abundant illustrations, the text is an ideal resource to prepare for success as an automotive technician or pursue ASE certification. Now updated with extensive information on new and emerging technology and techniques—including hybrid and electric vehicles, tire plus sizing, and computer-controlled suspensions—the Sixth Edition also aligns with area A4 of the NATEF 2012 accreditation model, including job sheets correlated to specific AST and MAST tasks. Ideal for aspiring and active automotive professionals, TODAY’S TECHNICIAN: AUTOMOTIVE SUSPENSION & STEERING SYSTEMS, Sixth Edition, equips readers to confidently understand, diagnose, and repair suspension and steering systems in today’s automobiles. This comprehensive, versatile text is ideal for both classroom and hands-on learning, with a dedicated Classroom Manual covering theory and application of automotive suspension and steering systems, and a separate Shop Manual focused on real-world service, diagnosis, and repair procedures. Full-color drawings, photos, and schematics show modern suspension and steering technology and applications in accurate detail, bringing chapter material to life and making even complex concepts and procedures easier to understand and apply. The text provides thorough coverage of the 2012 NATEF Automobile Program Standards for Suspension and Steering Systems and includes a full ASE practice exam, providing ideal preparation for students and professionals alike interested in pursuing ASE certification—as well as offering a reliable, up-to-date reference for today’s technicians. Detailed information on increasingly common technology—such as active steering systems, four wheel active steering (4WAS), PAX tire systems, adaptive cruise control (ACC), lane departure warning systems, telematics, electric-drive power steering pumps, electronic wheel alignment equipment, and tire pressure monitoring systems (TPMS)—prepares students for a seamless and successful transition from the classroom to the professional repair shop. 1. Suspension and Steering Systems Introduction and Overview. 8. Steering Columns and Steering Linkages. 9. Four Wheel Alignment Part I. 10. Four Wheel Alignment Part II. 13. Rack and Pinion Steering Gears and Four Wheel Steering. 14. Recirculating Ball Steering Gears.